Our selection of conjugated anti-His tag antibodies saves you time by removing the need for a secondary antibody. 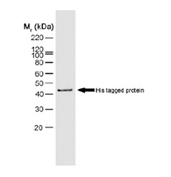 Like the MBP (maltose binding protein) and GST tag, the His tag is a small epitope tag consisting of between six to nine histidine residues, which is cloned into an expression vector upstream or downstream of a gene of interest. The vector is then introduced into an expression system such as bacteria, yeast or insect cells. The result is the expression of a recombinant protein carrying a polyhistidine tag at its N- or C-terminus. In order to purify the recombinant protein immobilized metal affinity chromatography (IMAC) is performed. This technique is based on the fact that a cord of histidine residues binds to immobilized metals such as Nickel. Anti-histidine antibodies can be used to monitor the progress of purification and the fraction containing the recombinant protein by western blotting, and to verify that no proteolytic degradation of the recombinant protein is taking place. Clone ABD2.2.20 has been used extensively in ELISA for the data generated to characterise anti-idiotypic antibodies.